This page tells the history and evolution of my websites since the day I stepped online up to now. Some of the dates aren’t really the exact ones but I try to make them accurate depending if my memory serves me well. Char Factor (January 29, 2008) was my first ever website built in basic HTML and hosted on Yahoo! Geocities— which was unfortunately, closed down by Yahoo back in October 26, 2009. This was where I first met my online friends who all played a part in making me who I am today. 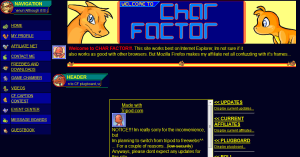 The whole inspiration for Char Factor started when I met my first online friend, better known as Umbreon97, back in January 24, 2008. I met her at the most random place– Arkeis‘ shoutbox, where at that time, she was launching her first website too, known as Umbreon’s Cavern. After that I’ve got the urge to make a website of my own too, and finally try out what I’ve learned in web programming, and so I did. As time passed by, my site grew as I’ve had more affiliates and visitors, among them were Sarah of PokéMysteries, Grovyle246 of the former Grovyle’s Forest which became Treeshroud Forest, Luxray080 of Luxray’s Den, and many more!. It grew much that Geocities’ disk space and bandwidth can no longer suffice for it, so I decided to move on to a new host. I’ve tried out a few like Bravenet, but eventually settled down with Tripod (February 27, 2008). This was where I started learning and using basic CSS on my layouts. After all these experiences of learning AND applying what I know of web development, I wanted to do more– it was never enough. Eventually, my curiosity got the better of me, and so I started studying the server sided PHP. But unfortunately, Freewebs doesn’t support PHP so I had to move to yet another host. It was then when I’ve read about this free webhost that supported PHP and MySQL from one of my affiliates (I believe it was li’l Umbreon of Umbreon’s Palace), known as Freehostia. At this new level of coding I’m willing to take on, I decided to make a fresh new start under a new name. So there I discontinued Char Factor and created Auropaws. 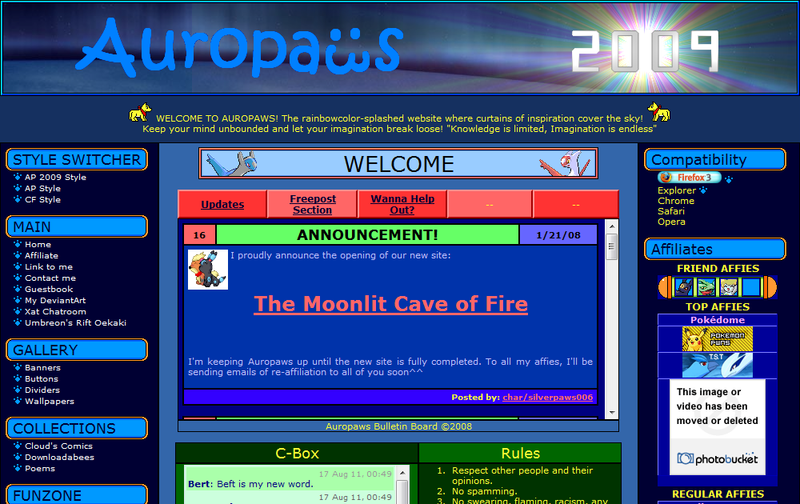 Auropaws (October 27, 2008), my new window of opportunity to learn more about web programming. Still retaining my concept of a Pokémon fansite, I built Auropaws as a playground for trying out PHP scripts and MySQL connections. It’s in this part of time where I had my Renaissance of web programming. After familliarizing myself with PHP and MySQL, I felt invincible— It’s like I can do anything! Then I had all these projects for myself like PokéPark, an attempted remake of Pokemon Crater; and CharificBoards, as inspired by Cutenews. Both failed of course, I never really had the patience to finish them. But nonetheless, I learn a lot with every project I experiment on, despite that they don’t come out successful. Everything went nice and steady from here on until one day, Umbreon97 wanted to revive her Umbreon’s Cavern after leaving it in the dust for some time. I sat down and eyed the rennovations from the sidelines, until the idea hit me. 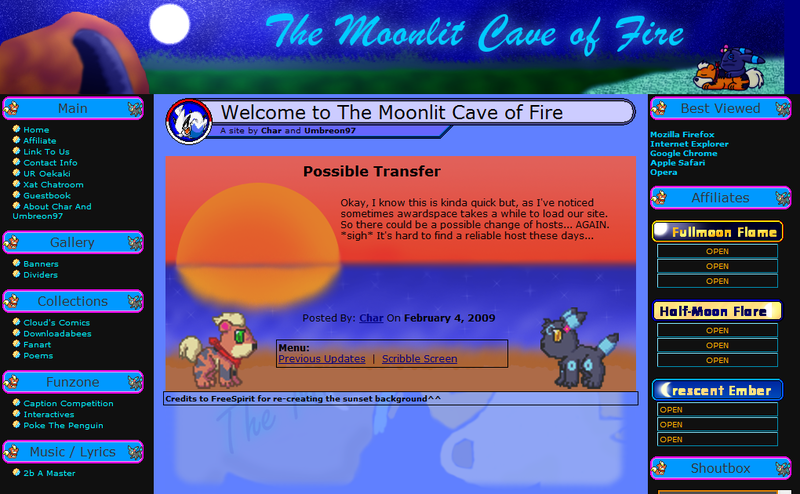 I proposed to merge Auropaws and Umbreon’s Cavern as one website combining both our ideas, at which Umbreon97 agreed. So I looked for a new host where we could put our fused websites. 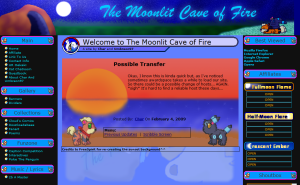 The Moonlit Cave Of Fire (January 21, 2009) became the new name for our fused websites, hosted under Awardspace. The content were combined from both Auropaws and Umbreon’s Cavern, and the color schemes matched after our pokésonas, a Growlithe and an Umbreon. Unfortunately, this site was a tad short-lived since we both were running out of ideas for a Pokémon fansite, not to mention the thousands of others out there. In less than a month, I got frustrated to my limits because of Awardspace’s downtimes and full database connections. Running out of choices, I started thinking of getting a paid hosting account once and for all. After much consideration and searching for a convenient webhost, I moved out of Awardspace. Auropaws.com (February 10, 2009) was my first purchased TLD on my first paid, shared server. I chose the name Auropaws because I still found it original— since Google doesn’t display results other than the keyword itself. I guess you could say it’s some kind of a webhost, but they were all good friends of mine. 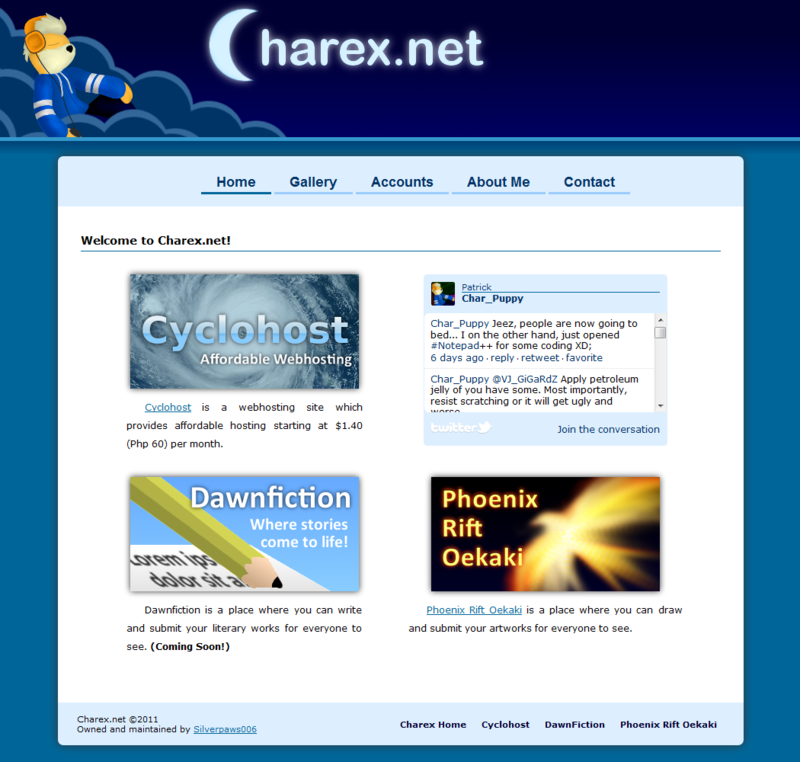 Charex.net (May 6, 2010) was initially a separate website from Auropaws. I picked it up because it’s a shorter name, easier to remember and actually has “Char” in it. I wanted it to be more of a personal site for myself and somewhat of a sitemap for all my websites. On the prevoius month though, September 2011, I launched a separate, pilot webhosting website known as Cyclohost. This of course, meant investment, spend a lot of money as capital and see if it pays off. Observing my expenses with 3 different domains and servers (Auropaws, Charex and Cyclohost), I figured I couldn’t handle it. I needed a solution, and fast— before I unnecessarily lose some more cash. October 2011, my solution and decision is to close down Auropaws and merge it into Charex.net— which would now be the new Auropaws. Now I’m only paying for 2 domains and 2 servers, just waiting for auropaws.com to expire on April 2012. Hopefully this cuts my costs, if it isn’t enough then I’m closing the Charex server and migrate the entire site to Cyclohost, meaning I’ll be hosting myself. 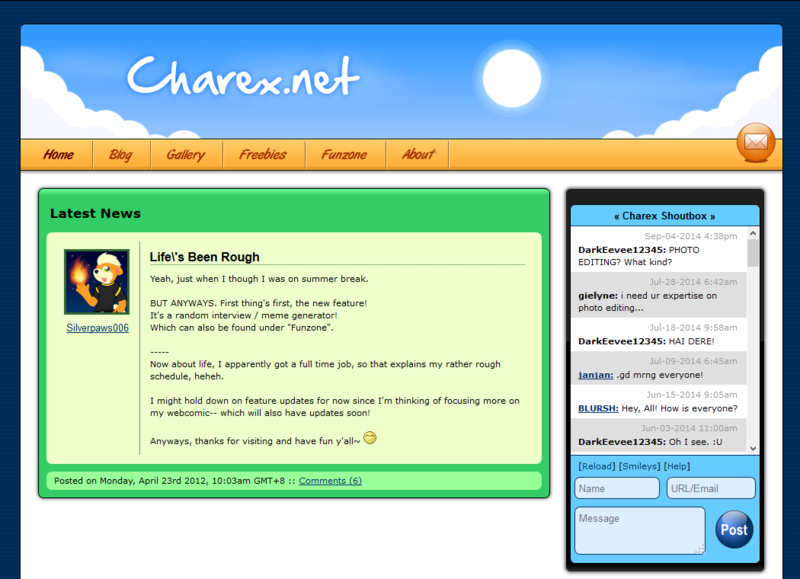 Charex.net (October 25, 2011 – April 2, 2012), was much like a remake of Auropaws.com. Only it did not just focus on being a Pokémon fansite, but a general website where people can come over and have fun. Admittedly this site wasn’t very active, but it did have stuff to offer like “Most Epic Story Ever!”, a Pokémon fancomic as generously provided by Captain_Cloud / Naito, and free resources and tools. It also included a time-based layout feature, which in the name itself, means the layout changes depending on the user’s time. There were a total of 6 different layouts, namely: Morning, Day, Afternoon, Dusk, Night, and Dawn. 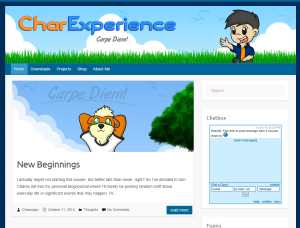 Charex.net (April 2, 2012 – October 10, 2014), was intended to be a personal site holding my blog and gallery as well as some freebies and fun activities. Unfortunately, I didn’t get much time to really work on it since I was approaching the peak of my college years and going into the transition phase towards my actual career. The website was mostly dormant after I finished setting it up, so there’s not much progress and/or events I can mention at this point. CharExperience or Charex.net 4.0 (October 10, 2014 – Present) now stands as a revival and brand new version of my domain. Now that I’ve graduated college and I’m slowly settling down with my career, I can spend more time actually maintaining my websites! 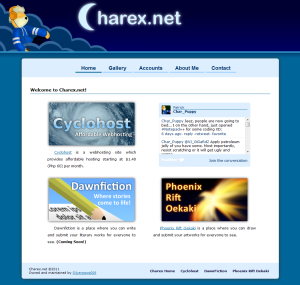 Remember my pilot web hosting site, Cyclohost? I’ve recently re-branded into VentusDrive Webhosting Solutions last September 19, 2014 as I’m slowly starting to turn it into a sustainable business. Hopefully I can reach that goal on or before 2015 ends. Likewise, I’m also bringing back Charex.net as CharExperience since some dum company now owns and uses “Charex” as their brand and I can’t do anything about it. It will serve as a blog where I’ll be posting various stuff like my travels, food adventures, thoughts, and more! I will also put in here some info about myself as well as my wishlist and portfolio (for career reasons). I will strive to make blog updates every Saturdays from here on in, so be sure to check me out often!